Enjoy Playing One of Ireland's Oldest Links Golf Courses. 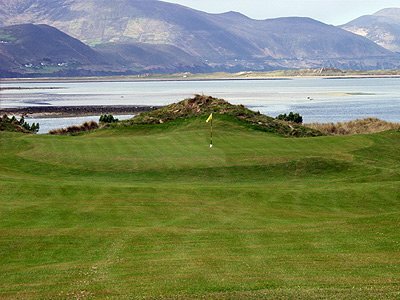 If you are on a golfing break in Kerry you won't want to miss the opportunity to play Dooks. For me Dooks is one of the unsung gems of Irish golf. For the good to average player Dooks is a premier example of links-style golf. It is far more difficult than it looks. In addition it is a beautiful place sandwiched between Macgillicuddy`s Reeks reaching to the sky in the south and Dingle bay to the north. In all, Dooks is a thoroughly enjoyable course to play. Dooks Golf Club was founded in 1889 and is one of the 5 oldest Links in Ireland, the charm, the atmosphere and the superb seaside setting of a truly traditional golf links makes Dooks a golf experience that has to be experienced at least once in a lifetime. The course is set out on one of three stretches of sand dunes at the head of Dingle Bay. The course is known to be the hidden gem of the south-west, with golfers getting to experience links golf at its best without the premium green fee. The test begins at once. The par four first hole is a gently curving dog-leg left with a green you can`t see from the tee. The front 9 features some tightly laid out holes where accuracy is paramount. Most notable is the par-4 7th which is almost impossible to reach in 2 if the wind is against you. The 150 yard 13th hole has been quoted as a throwback to the time when golf began, with the approach playing into an amphitheatre style green. The closing hole, a long, slightly uphill par 4 to a guarded green provides a tough ending to a wonderful track. The finishing hole is one of the best in Ireland. The 494yd par 5 eighteenth plays uphill from the tee, a shot that will roll sharply to the left if not hit right of the centre, and will find the deep rough if it is hit too far to the right. There is a marker post visible from the tee box. My advice is to aim slightly to the right of that. The green is not visible from the tee, nor from where ever that tee shot comes to rest. Certain points on the fairway might give you a glimpse of the flag, but the green itself is shielded by two huge dunes. Big hitters can reach this hole in two, but ba long low shot that clears the dunes will clear the green too. A high second shot risks not clearing the dunes at all and hanging up in their thick soft grass. The best birdie opportunity comes from a well struck chip shot. Dooks Golf Links club is renowned for its friendliness and invites all its visitors to enjoy the unique atmosphere of the clubhouse. Even though it has been extensively remodelled, great care was taken to ensure it retained its old world charm and quirkiness. One can relax in the bar which was specially designed so that people at one end of the bar could speak to those at the other. Enjoy a pint of the best Guinness and recharge the batteries by availing of our excellent catering facilities which are available throughout the day. There is a purpose-built, well-equipped pro shop, which stocks all the top brands. Here you can purchase all types of golf accessories, presents and can avail of the rental facilities for club hire, trolley hire and buggy hire and caddies. It is important that all intending visitors make reservations as early as possible. 1. Our group of four's experience was wonderful at Dooks. It is the second time I've played the course in the last three years and the course and staff couldn't be much better. We rented clubs which were brand new Titleist 917's. The course is a fair test and unlike some of the nearby, more well- known courses (Ballybunion, Waterville, etc. ), it's not overplayed and crowded. I can't say enough about the staff, from the time I booked the four-ball, nearly a year in advance, through the actual round, they were friendly and accommodating. Our group was not in Ireland to just play golf, but to tour, so they enjoyed the diversion on a spectacular day. It is a great links course, with wonderful views and nice layout. 2. This was a great course with fabulous views, great layout and the best people. This was a substitute for Waterville on our 7 day trip. We were not sure what to expect but boy were we surprised. Would definitely play again. People were great. Caddies were great. Great Brand New Taylor Made Rental Clubs. Airline lost mine! Practice area is a net to hit into for one person at a time, Oh well. Plan to play here! 3. Ok, so you're in Kerry, lots of places are going to have you gaping in awe at your surroundings, but believe me, this is quite simply the most beautiful place to play golf. We arrived (in sideways rain) for an 8:50 tee off. The pro shop, when booking, asks if you can arrive 30 mins earlier and glad we did. We were welcomed like old friends, and given a bit of a rundown re course conditions, where everything was and invited to change at leisure and make use of the putting and chipping areas to loosen up. One of our party had asked to hire clubs...you have never seen a group of more jealous faces, when he was presented with a brand new, full set of titleists !!! (All of us made a note to hire clubs on our next visit). We went into the locker room, (which has an Augusta type feel), and changed into our weather gear and popped everything in the good size lockers. (They don’t charge for lockers either which was a nice touch). After a bit of putting and chipping we took to the first tee. You walk up a small gradient and onto the tee behind the pro shop/club house.....BEHOLD!!!!! Even in the rain and gale force winds, nothing could have detracted from the vista that greeted us. I even had a quick peek over the small rise running adjacent to the first hole and the majesty of view that greets you in beyond my writing abilities. There are simply not enough superlatives. It quite simply must be seen to be believed. And so it went on. Hole after hole of incredible beauty and a good test of golf shots. Greens were true, lightening quick and surrounded by the types of pot bunkers that make people weep if stuck in one and apoplectic with joy when they get out of one. The greens do undulate and take the ball on a merry dance after is leaves the putting face, but you sink one and you will be reliving it over and over for years to come. In my opinion, the front nine where a tad tougher but there is not much in it and to be honest, if you are having a bad hole simply look up, look around and smile. Bad holes here won’t stick in the memory but the scenery and majesty of your surroundings will. We finished in good time, only held up on one hole and even then, only because the wind had picked up severely and across the course huddled figures braced against the wind and not a shot was attempted by any. We showered and changed (you request towels at the bar), and went in for a few pints and a review of the round. All of us (even the guy that had a mare and promised he was quitting golf and taking up crown green bowling), were nonstop complimentary.